Choice of equipment: I initially bought a Fortress FX7 since that was what was listed as an optional extra for the BC20 (although I didn’t buy it from Swallow Boats). I now use a 6kg (13lb) Kobra anchor with 10m of 7mm chain and 30m of 10mm nylon as my main “bower” anchor. Installation: The Kobra fits in the starboard bow locker (just) and the Fortress is in the cockpit locker. Fortress FX7: This anchor weighs 1.9 kg (4lb) which seems very light, however reviews of Fortress anchors are generally very favourable. It has a soft mud configuration – however that means taking the anchor apart as does collapsing it for stowage. Only two screws have to be undone but aligning the bits could be a fiddle when afloat. I’ve hardly used it since it will not fit in the bow locker unless dis-assembled and I got fed up with it being on deck. In some review tests it did not reset well on the turn of the tide. Keeping it as my kedge anchor seems a sensible option. It fits into the cockpit locker in one piece and it doesn’t add much weight to the boat. It has a short length of 6mm chain plus 8mm nylon rope. 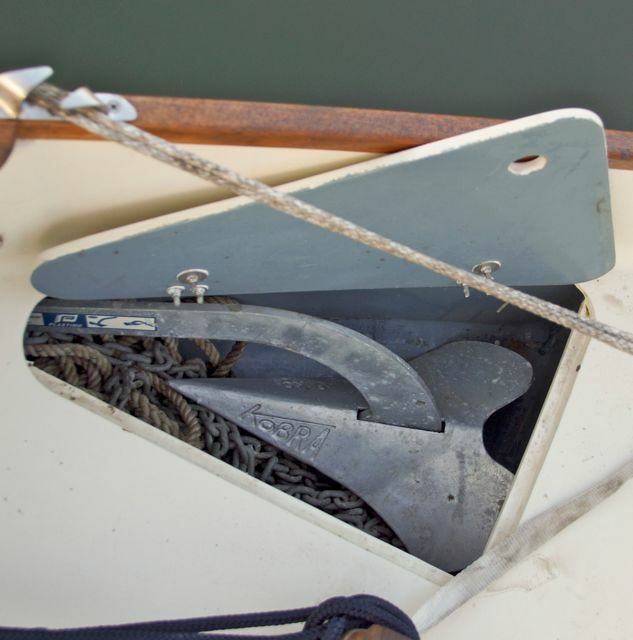 Kobra Mk1 6kg: I tried to fit an 8 kg Kobra in the bow locker – it was possible but too tight to be practicable. Even the 6kg model needs a bit of shuffling of the chain and warp to fit. I chose the Kobra because it generally came second to the Fortress in holding tests and was better at resetting when the tide turned. The 6kg anchor is specified for boats up to 8m and I’m hoping that that, plus the weight of chain, will give me adequate holding – it’s worked on the few times I’ve used it. However I have read that in mud or sand, plough type anchors will do just that – continue to plough. Fortunately, I know that the anchor alarm on the Garmin Echomax works since I always forget to cancel it before weighing anchor! The Kobra folds to go into the locker with the shank collapsing towards the tip – I haven’t worked out how to fold it, I work it about and eventually it just happens. I am getting quicker at it. Bow roller: I don’t tend to use this when setting or weighing anchor, however Seatern does ride better with the rode in the bow roller rather than through one of the fairleads. I had to swap the roller from port (where Swallow Boats had installed it) to starboard because the roller furling gear is to port. Note added 2017: To save weight I’ve reduced the amount of chain on the Kobra to 5.4m, so far it still seems to hold. The bow roller is no longer fitted – I think it helped damage the bow in 2015 and it was not refitted after Seatern was repaired. The Fortress is now stored in the cabin forepeak area. Note added 2018: I’ve now replaced the bow roller because I have removed the bow fairleads. The latter (seen top left in the photo above) tended to snag the spinnaker sheets when it was hoisted while furled using the top-down furler.